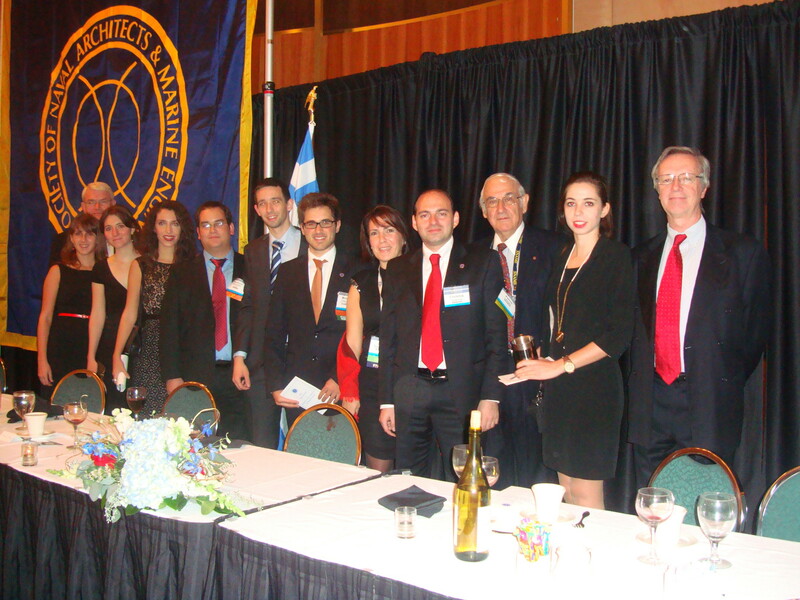 The Greek Section of the prestigious international Society of Naval Architects & Marine Engineers (SNAME) had an impressive participation in the October 2012 SNAME Annual Meeting in Providence, Rhode Island in USA. Ten of its members attended the week long meetings and activities: 7 student SNAME members from the National Technical University of Athens (NTUA), Department of Naval Architecture, Prof. Harilaos Psaraftis of NTUA and SNAME International Regional Vice President who presented a paper, Petros Lalangas, Manager of SNAME's European Regional Office (SERO), based in Paleon Faliron and Dr. Christos Kontovas, Exec. Com. member of the Greek Section. The title of Prof. Psaraftis presentation was ‘‘Modeling Tanker Optimal Speed & Emissions: The case of VLCCs’’ and was co-authored with C. Gkonis. Also, the NTUA student Yvonni-Effrosyni Damianidou presented at the student session the paper ‘‘North American ECA Regulations and LNG Fuels-A Viable Solution?’’. These papers were printed also in the Annual Meeting Proceedings. • 40 plus hours of exceptional peer reviewed papers, special panel discussions, and cutting edge Technical & Research sessions. • Ship Operations Cooperative Program (SOCP) fall meeting. • Student program featuring a design competition; student papers track; job, scholarship, and graduate school fair; student congress and elections; and student summit. 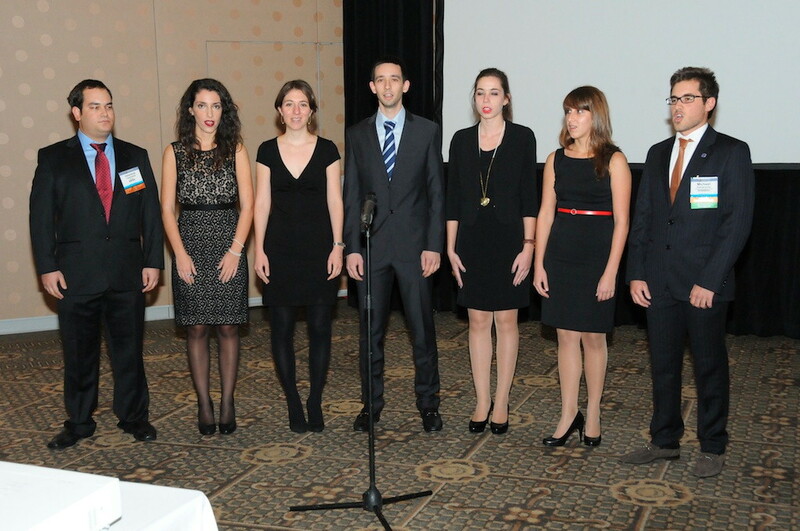 The highlight of the Annual Meeting was the formal annual banquet, where SNAME presented its highest awards, honors and medals in front of some 800 participants. In the 119 year history of SNAME, the banquet always started with the singing of the US and Canadian anthems and the display of their flags. This year the Greek Section and its members were honored with the display of the Greek flag and the singing a capella by the students of the Greek National Anthem, who sung it beautifully (see attached photo). 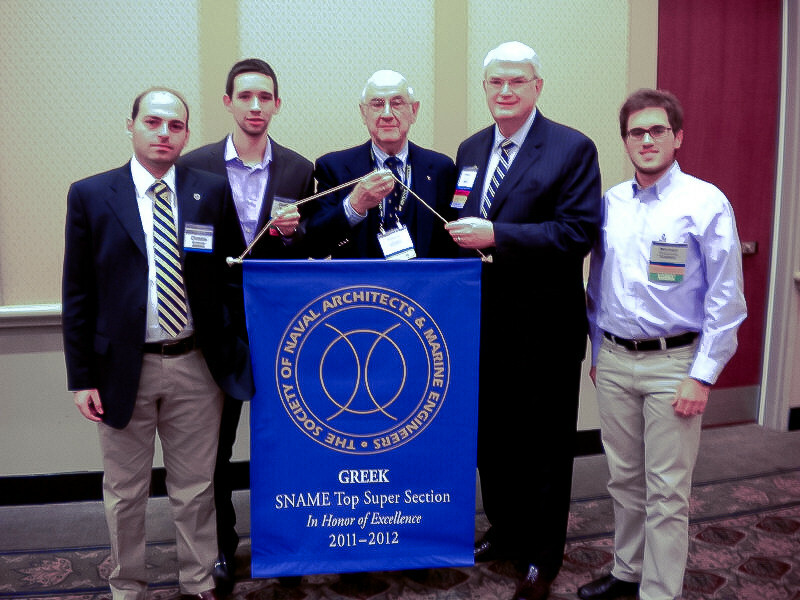 Among the 8000 members that SNAME has around the world, Greece has the highest number of members (some 320) outside of North America and the Greek Section was recognized by receiving the Top Super Section Banner. It was recognized as the best Section among all 16 Sections that SNAME has. The SNAME Top Super Section banner was awarded in Honor of Excellence in its monthly technical program and for meeting the high SNAME operational standards.